Atlantic Water flows towards the Arctic and under floating glaciers on Greenland. Observations in a rift on the 79 North Glacier show presence of such water with temperature of 1 °C at 600 m. We simulate how this warm water melts the floating ice. Melt rates are largest where the glacier starts floating, are smaller where the water rises, and increase linearly with rising ocean temperature. Our results improve the understanding of ocean processes driving melting of floating glaciers. A comparison of forest damage with windstorm intensity in Finland suggests that the volume of forest damage follows approximately a power relation as a function of wind gust speed with a power of ~10. This tentative estimate holds for typical windstorms having mainly westerly winds and affecting large areas in southern and central parts of Finland. 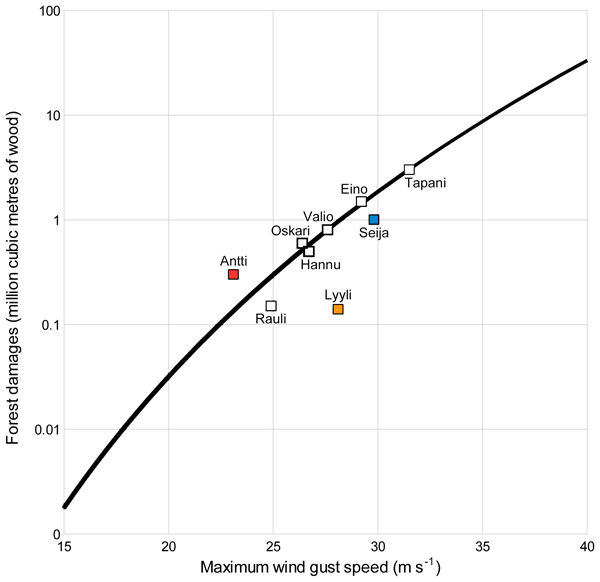 The estimate can be utilized when preparing impact-based predictions of windstorms. Inference of the tropopause from temperature profiles of finite vertical resolution entails an uncertainty of the tropopause altitude. We assess this effect by degrading the resolution of the sonde data. For tropical radiosonde profiles the tropopause altitude inferred from coarse grid profiles was found to be lower than that inferred from the original profiles. E.g., the mean displacement of the lapse rate tropopause inferred from a 3 km resolution profile is −240 m.
This study investigates the role of the clustering of extratropical cyclones in driving wintertime wind losses across a large European region. 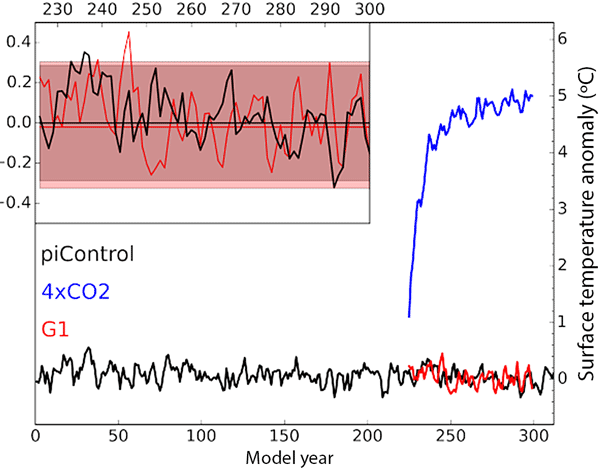 To do this over 900 years of climate model data have been used and analysed. The main conclusion of this work is that cyclone clustering acts to increase wind-driven losses in the winter by 10 %–20 % when compared to the losses from a random series of cyclones, with this specifically being for the higher loss years. This study proposes a modification to a stochastic downscaling method for precipitation, RainFARM, to improve the representation of the statistics of the daily precipitation at fine scales (1 km) in mountain areas. This method has been demonstrated in the Alps and it has been found to reconstruct small-scale precipitation distribution. It can be employed in a number of applications, including the analysis of extreme events and their statistics and hydrometeorological hazards. A new generation of global climate models with resolutions between 50 and 10 km is becoming available. Here, we assess how well one such model simulates European precipitation. We find clear improvements in the mean precipitation pattern, and importantly also for extreme daily precipitation over 30 major European river basins. Despite remaining limitations, new high-resolution global models hold great promise for improved climate predictions of European precipitation at impact-relevant scales. An extensive assessment of the performance of the chemistry–climate model EMAC is given for Arctic winters 2009/2010 and 2010/2011. The EMAC simulations are compared to satellite observations. The comparisons between EMAC simulations and satellite observations show that model and measurements compare well for these two Arctic winters. However, differences between model and observations are found that need improvements in the model in the future. We analyse simulations from the Chemistry-Climate Model Initiative (CCMI) to estimate the return dates of the stratospheric ozone layer from depletion by anthropogenic chlorine and bromine. The simulations from 20 models project that global column ozone will return to 1980 values in 2047 (uncertainty range 2042–2052). Return dates in other regions vary depending on factors related to climate change and importance of chlorine and bromine. Column ozone in the tropics may continue to decline. 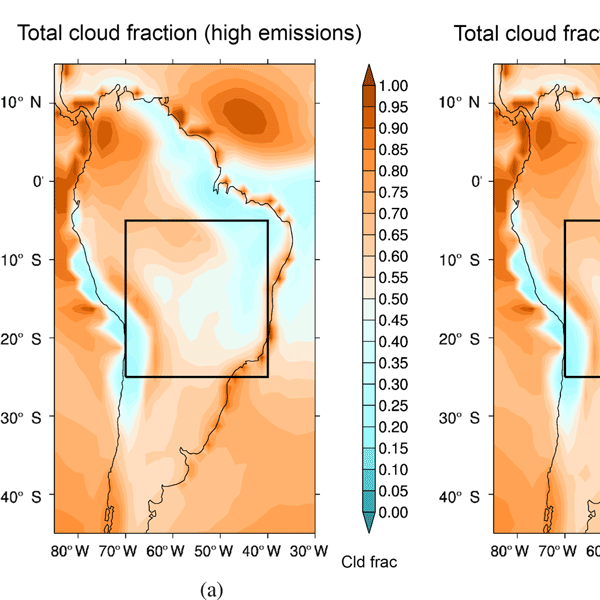 We investigated the impact on the regional climate of different amounts of smoke emission (aerosol) from the burning of vegetation in South America using a climate model. We looked at differences between high and low smoke emissions and found impacts from the higher smoke emissions on the amount of cloud cover, solar radiation reaching the surface, wind patterns and rainfall. This means the local climate may be affected if there is more deforestation and more smoke from burning of vegetation. 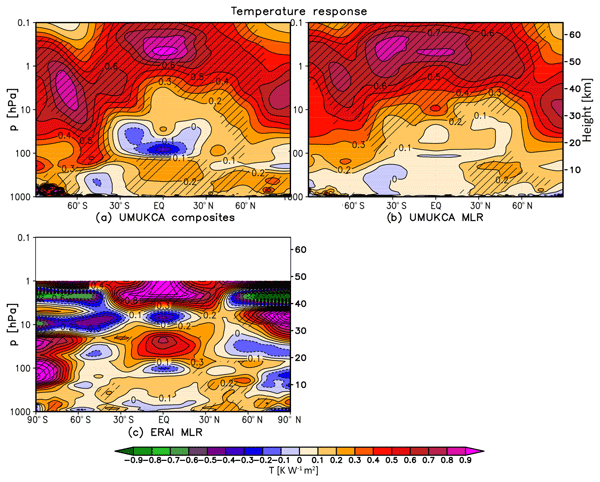 The atmospheric response to the 11-year solar cycle in UM-UKCA is separated into the contributions from changes in direct radiative heating and photolysis rates, and the results compared with a control case with both effects included. It is shown that while the tropical responses are largely additive, this is not necessarily the case in the high latitudes. We suggest that solar-induced changes in ozone are important for modulating the SH dynamical response to the 11-year solar cycle. 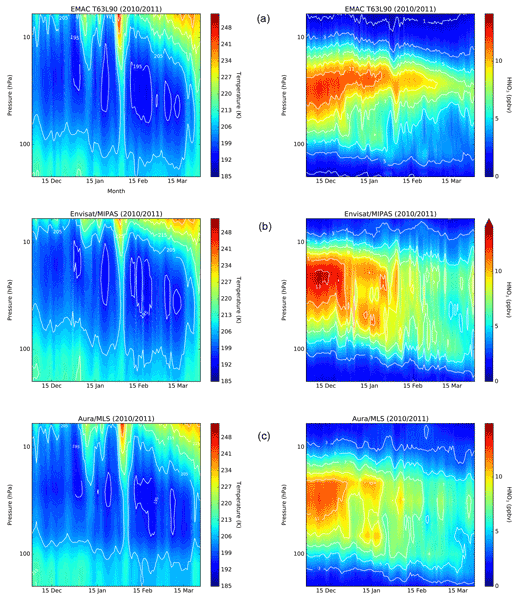 This paper documents the numerical experiments to be used in phase 1 of the Stratosphere–troposphere Processes And their Role in Climate (SPARC) Quasi-Biennial Oscillation initiative (QBOi), which was set up to improve the representation of the QBO and tropical stratospheric variability in global climate models. The 2015/2016 Arctic winter was one of the coldest winters in recent years, allowing extensive PSC formation and chlorine activation. Model simulations of the 2015/2016 Arctic winter were performed with the atmospheric chemistry–climate model ECHAM5/MESSy Atmospheric Chemistry (EMAC). We find that ozone loss was quite strong but not as strong as in 2010/2011; denitrification and dehydration were so far the strongest observed in the Arctic stratosphere in at least the past 10 years. Weather, climate and climate change can cause significant risks to businesses and public administration. By asking Finnish organizations about their weather and climate risk perceptions and management, this study aims to improve ways climate services can support in adapting to current and future climate. The results indicate that climate risk management is often de-centralized and relies on expert networks but that practices differ between actors. In this research, SWAT was used to model the upper Blue Nile Basin where comparisons between ground and CFSR data were done. Furthermore, this paper introduced the SWAT error index (SEI), an additional tool to measure the level of error of hydrological models. This work proposed an approach or methodology that can effectively be followed to create better and more efficient hydrological models. The estimate of the current and future conditions of snow resources in mountain areas depends on the availability of reliable fine-resolution data sets and of climate models capable of properly representing snow processes and snow–climate interactions. This work considers the snow water equivalent data sets from remote sensing, reanalyses, regional and global climate models available for the Alps and explores their ability to provide a coherent view of the snowpack features and its changes. In this paper, the recently developed module for trace gas emissions in the online coupled modelling framework ICON-ART for atmospheric chemistry is presented. Algorithms for offline and online calculation of the emissions are described. The module is validated with ground-based as well as airborne measurements of acetone. It is shown that the module performs well and allows the simulation of annual cycles of emission-driven trace gases. Finnish Meteorological Institute and Helen Ltd examined the feasibility of long-range forecasts (longer than two weeks) of temperature for needs of the energy sector in Helsinki, Finland. In this study, we examined the quality of Heating degree day (HDD) forecasts. As the forecasts we used UK Met Office seasonal forecasts. The long-range forecasts of monthly HDD showed some skill in Helsinki in winter 2015–2016, up to two months, especially if the very cold January is excluded. The BFMCOUPLER (v1.0) is a coupling scheme that links the MITgcm and BFM models for ocean biogeochemistry simulations. The online coupling is based on an open-source code characterizd by a modular structure. Modularity preserves the potentials of the two models, allowing for a sustainable programming effort to handle future evolutions in the two codes. The BFMCOUPLER code is released along with an idealized problem (a cyclonic gyre in a mid-latitude closed basin). Data on atmospheric trace gases have been collected with instruments on-board a commercial airliner for more than 10 years in the CARIBIC project. We investigate which species in the dataset can be used for a representative climatology, by comparing data from the chemistry–climate model EMAC along the flight paths to a larger set of model data. We find that long-lived species are captured quite well by the CARIBIC sample while this is not the case for more variable, shorter-lived species. Freezing rain is a high-impact wintertime weather phenomenon. The direct damage it causes to critical infrastructure (transportation, communication and energy) and forestry can be substantial. In this work a method for estimating the occurrence of freezing rain was evaluated and used to derive the climatology. The method was able to accurately reproduce the observed, spatially aggregated annual variability. The highest frequencies of freezing rain were found in eastern and central Europe. Export of Arctic sea ice area southwards through the Fram Strait from 1935 to 2014 is calculated based on satellite radar images and surface pressure observations. The annual mean export is 880 000 km2, representing 10 % of the Arctic sea ice area. In recent years the export has been above 1 million km2, and there are positive trends over the last 30 years. Increased ice export during spring and summer contributes to more open water in September, and this correlations has increased over time. The extent of anthropogenically driven Antarctic ozone depletion prior to 1980 is examined using transient chemistry–climate model simulations from 1960 to 2000 with prescribed changes of ozone depleting substances in conjunction with observations. All models show a long-term, halogen-induced negative trend in Antarctic ozone from 1960 to 1980, ranging between 26 and 50 % of the total anthropogenic ozone depletion from 1960 to 2000. A stronger ozone decline of 56 % was estimated from observation. We have investigated for the first time the heterogeneous hydrolysis of ClONO2 on TiO2 and SiO2 aerosol particles at room temperature and at different relative humidities (RHs), using an aerosol flow tube. The kinetic data reported in our current and previous studies have been included in the UKCA chemistry–climate model to assess the impact of TiO2 injection on stratospheric chemistry and stratospheric ozone in particular. We studied the impact of projected climate change on the risk of snow-induced forest damage in Finland. Although winters are projected to become milder over the whole of Finland, our results suggest than in eastern and northern Finland the risk may increase while in southern and western parts of the country it is projected to decrease. This indicates that there is increasing need to consider the potential of snow damage in forest management in eastern and northern Finland. 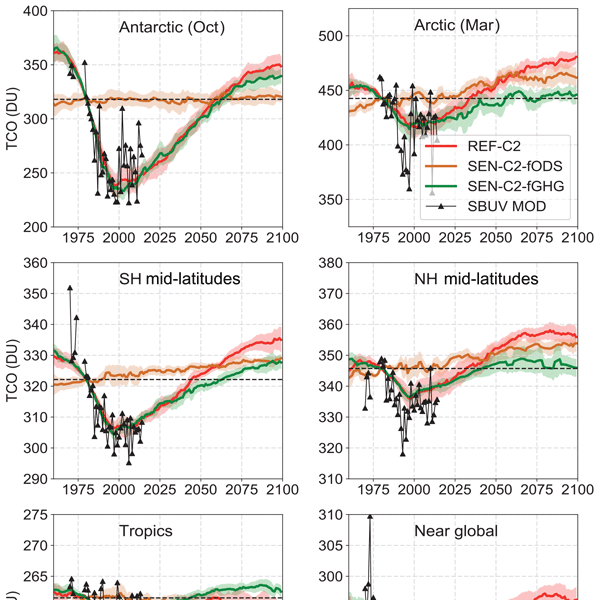 Future trends in springtime Arctic ozone, and its chemical dynamical and radiative drivers, are analysed using a 7-member ensemble of chemistry–climate model integrations, allowing for a detailed assessment of interannual variability. Despite the future long-term recovery of Arctic ozone, there is large interannual variability and episodic reductions in springtime Arctic column ozone. Halogen chemistry will become a smaller but non-negligible driver of Arctic ozone variability over the century. We introduce a diagnostic tool to assess in a climatological framework the optimal propagation conditions for stationary planetary waves. Analyzing 50 winters using NCEP/NCAR reanalysis data we demonstrate several problematic features of the refractive index of Rossby waves. We introduced the Rossby waves membership value function to calculate the optimal propagation conditions for Rossby waves. Sensitivity of our diagnostic tool to strong and weak vortex regimes are examined. Various forms of solar radiation management (SRM) have been proposed to counteract man-made climate change. However, all these countermeasures could have unintended side-effects. We add a novel perspective to this discussion by showing how atmospheric ozone changes under solar geoengineering could affect UV exposure and air pollution. This would have implications for human health and ecology. Atmospheric composition changes are therefore important to consider in the evaluation of any SRM scheme. We present an extensive data set of ground-based and airborne electromagnetic ice thickness measurements covering Fram Strait in summer between 2001 and 2012. An investigation of back trajectories of surveyed sea ice using satellite-based sea ice motion data allows us to examine the connection between thickness variability, ice age and source area. In addition, we determine across and along strait gradients in ice thickness and associated volume fluxes. The number of large forest fires in Finland will most likely increase during the twenty-first century in response to projected climate change. This would increase the risk that some of the fires could develop into real conflagrations which have become almost extinct in Finland due to effective fire suppression. 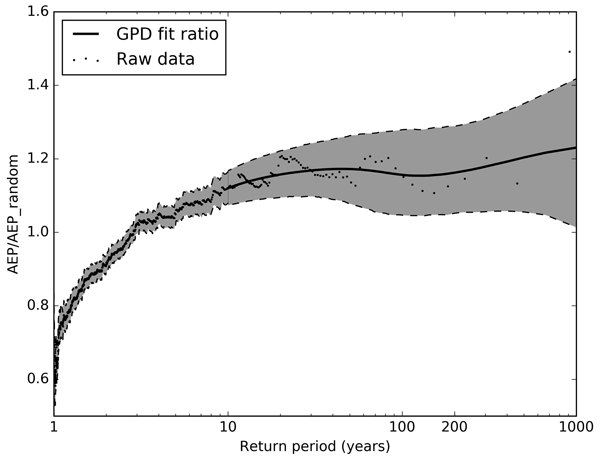 However, our results show considerable inter-model variability, demonstrating the large uncertainty related to the rate of the projected change in forest-fire danger. Our sensitivity studies based on air parcel trajectories confirm that Polar stratospheric cloud (PSC) formation is quite sensitive to water vapour and temperature changes. Considering water vapour time series from satellite measurements we do not find a consistent, significant trend in water vapour in the lower stratosphere during the past 15 years (2000–2014). Thus, the severe dentrification observed in 2010/2011 cannot be directly related to increases in stratospheric water vapour. First modeling work comparing SHYFEM and MITgcm performance in the north Adriatic Sea; the treatment of heat/mass fluxes at the surface affects the models skill to reproduce coastal processes; high resolution is needed close to the coast, while lower resolution in the offshore is adequate to capture the dense water event; correct river discharges and temperature are vital for the reproduction of estuarine dynamics; non-hydrostatic processes do not influence the dense water formation. A new and updated timeseries of Fram Strait sea ice area export from 1979 - 2013 shows an overall increase until today. Spring and summer ice area export increases more (14% per decade) than in autumn and winter, and these export anomalies have a large influence on the following September mean ice extent. Wind speed measured at the German stations correlate well with reanalysis fields. Monthly means from two global reanalyses (ERA-20C, ERA-Interim) and one regional reanalysis (COSMO-REA6) were analysed and correlate well for the majority of the German stations. Thus we conclude that the monthly and seasonal anomalies recorded at these stations can be understood as representative for a spatial area comparable to the resolution of the reanalyses, at least for the recent years. Emergency rescue data and weather reanalysis data were combined to study the spatial and decadal characteristics of potential forest damage days in Finland due to windstorms. The most prone area for damage days was the south-western part of Finland. Results also indicated a lull period during the 1990s compared to the 1980s and 2000s, albeit no trend was evident. The study highlighted the importance of not only focusing on wind speeds, but also soil conditions. Many users of climate information are unaware of the availability of reanalysis feedback data and input observations, and uptake of feedback data is rather low. The most important factors limiting the use of this data is that the users feel that there is no easy interface to get the data or they do not find it at all. The relevant communities should invest resources to develop tools and provide training to bridge the gap between current capabilities and comprehensive exploitation of the data. We assessed the quality of the seasonal precipitation forecasts issued by Regional Climate Outlook Forum for Malawi and Zambia. The forecasts, issued in August, are of rainy season rainfall accumulations for early and late season. The forecasts are rather well-calibrated, but cannot discriminate between different events. But these results can be too pessimistic, because forecasts have gone through much development lately, and forecasts using current methodology might have performed better. How sensitive is the recovery of stratospheric ozone to changes in concentrations of very short-lived bromocarbons? Adler, C., Palazzi, E., Kulonen, A., Balsiger, J., Colangeli, G., Cripe, D., Forsythe, N., Goss-Durant, G., Guigoz, Y., Krauer, J., Payne, D., Pepin, N., Peralvo, M., Romero, J., Sayre, R., Shahgedanova, M., Weingartner, R., and Zebisch, M.: Monitoring Mountains in a Changing World: New Horizons for the Global Network for Observations and Information on Mountain Environments (GEO-GNOME), Mt. Res. Dev., 38, 265–269, 2018. ECRA: Minutes of the 3rd ECRA-Meeting, internal document, 21 January 2011, ECRA Secretariat, Brussels, 2011a. ECRA: 1st Executive Committee meeting of the European Climate Research Alliance, 5 October 2011, ECRA Secretariat, Brussels, Minutes of the Meeting, available at: http://www.ecra-climate.eu/about-us/executive-committee(internal area, last access: 9 May 2018), 2011b. ECRA: Participation ECRA General Assembly 25–26 March 2015, List of Participants, Internal document of the ECRA Secretariat, ECRA Secretariat, Brussels, 2015. ECRA: Participation ECRA General Assembly 7–8 March 2017, List of Participants, Internal document of the ECRA Secretariat, Brussels, 2017. ECRA: Version 5 of the ECRA Governing Document, to be ratified by the 16th Executive Committee Meeting in September 2019, ECRA Secretariat, Brussels, Belgium, 2018. Freepngimg.com: Earth symbol in Illustration 1 available at: http://www.freepngimg.com/png/13540-earth-png-hd, last access: 3 May 2018. Gregow, H., Jylhä, K., Mäkelä, H., Aalto, J., Manninen, T., Karlsson, P., Kaiser-Weiss, A., Kaspar, F., Poli, P., Tan, D., Obregon, A., and Su, Z.: Worldwide survey of awareness and needs concerning reanalyses, and respondents' views on climate services, B. Am. Meteorol. Soc., 97, 1461–1473, https://doi.org/10.1175/BAMS-D-14-00271.1, 2015. Gregow, H., Muzaffer, E. A., and Laaksonen, A.: Increasing large scale windstorm damage in Western, Central and Northern European forests, 1951–2010, Scientific Reports, available at: http://rdcu.be/q66j (last access: 10 October 2018), 2017. Harjanne, A., Haavisto, R., Tuomenvirta, H, and Gregow, H.: Risk management perspective for climate service development – Results from a study on Finnish organizations, Adv. Sci. Res., 14, 293–304, https://doi.org/10.5194/asr-14-293-2017, 2017. JPI Climate: Joint Programming Initiative Climate Launch Event report, available at: http://www.jpi-climate.eu/media/default.aspx/emma/org/10826603/JPI_Launch_Event_Brussels_FINAL.pdf (last access: 5 May 2018), 2012. Kämäräinen, M., Hyvärinen, O., Jylhä, K., Vajda, A., Neiglick, S., Nuottokari, J., and Gregow, H.: A method to estimate freezing rain climatology from ERA-Interim reanalysis over Europe, Nat. Hazards Earth Syst. Sci., 17, 243–259, https://doi.org/10.5194/nhess-17-243-2017, 2017. Lehtonen, I., Venäläinen, A., Kämäräinen, M., Peltola, H., and Gregow, H.: Risk of large-scale fires in boreal forests of Finland under changing climate, Nat. Hazards Earth Syst. Sci., 16, 239–253, https://doi.org/10.5194/nhess-16-239-2016, 2016a. Lehtonen, I., Kämäräinen, M., Gregow, H., Venäläinen, A., and Peltola, H.: Heavy snow loads in Finnish forests respond regionally asymmetrically to projected climate change, Nat. Hazards Earth Syst. Sci., 16, 2259-2271, https://doi.org/10.5194/nhess-16-2259-2016, 2016b. The European Climate Research Alliance is a bottom-up association of European research institutions helping to facilitate the development of climate change research, combining the capacities of national research institutions and inducing closer ties between existing national research initiatives, projects and infrastructures. This article briefly introduces the network's structure and organisation, as well as project management issues and prospects.